least you are doing it with good stuff!!! Anxious to see it! I love the crumpled mess. The colors and scrappyness are so you. Impatiently waiting for the reveal! Being a little sister also I understand the need and talent it takes to tease people. It really is an art perfected at the mercy of our older sisters - carried on throughout our lives - right? I love a mystery, so fear not--I won't call you a brat :) Looking forward to seeing it in full glory! Lovely fabrics used in this quilt. 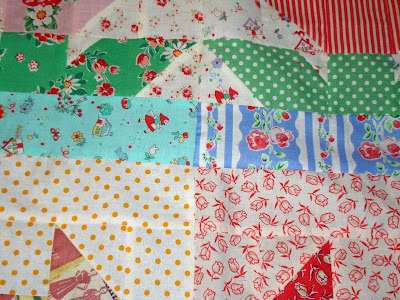 Can't wait to see the flimsy become a finished quilt! I love how your scrappiness always looks so good together! Will be fun to see the unveiling of your quilt when you can show it! If I was going to be out of town I would be heading to Broadbents tomorrow to see your new creation, you big tease. Oooooh! A new quilting term learnt today "flimsy" and to think I have a room full of them and didn't know! I haven't got a clue but I am loving those 1930s fabrics. And you were the baby of the family? I was the unloved middle child! Love the colors and yes, you are being a brat...big time! I can't figure it out so I guess I'll just have to wait for the REAL reveal! Bring it on! I don't think you are a bit bratty. You just show what you can, when you can. The fabrics are beautiful. Looking forward to when you can show more. Nanette, I cannot believe you were ever bratty! And you're showing us what you can, nothing bratty about that! 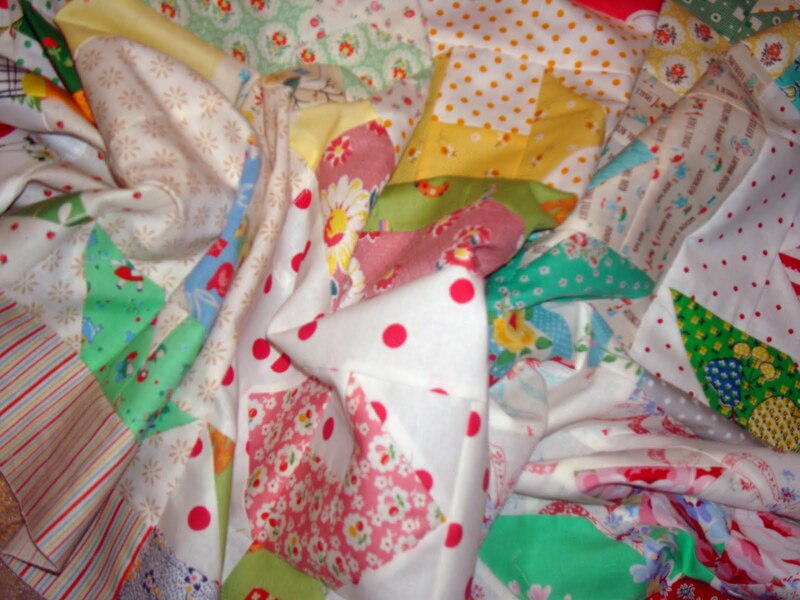 I love your fabrics, they are so YOU! You are too funny! I love teaser posts and this is no exception!! Love the fabrics and can't wait for the reveal, you tease you!! Seriously, is that the brattiest thing you could come up with Nannette! LOL! Just kidding! Scrappiness...hhmmm...yep, it's in my dictionary too! You are a brat! I'm dying to know and wish I could go and check it out. 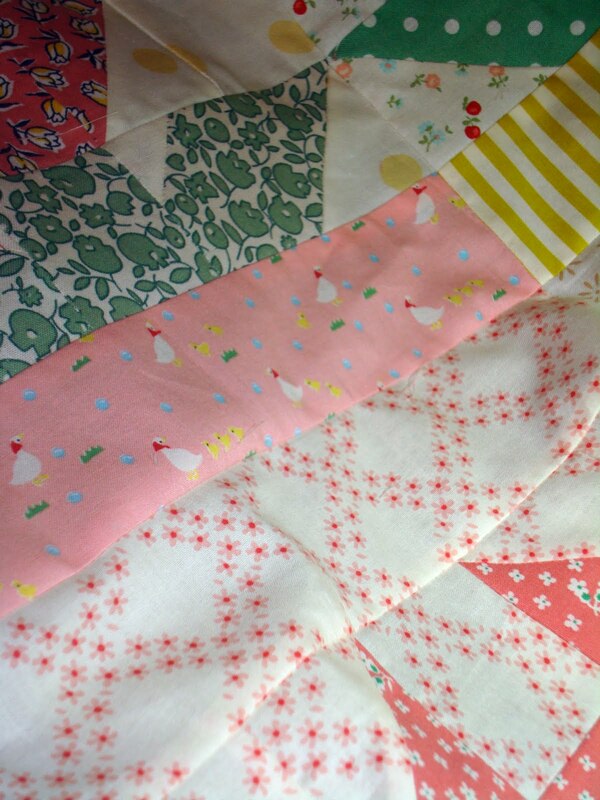 It looks very cute and I'll happily come back to see the whole quilt. Too funny! I agree with you, sneak peeks can be kind of annoying (but sometimes necessary). And I want to know the ending of a movie before I go see it, too!